Environmental noise is any unwanted or harmful outdoor sound caused by human activity, including the noice emitted by by road, rail, water and air transport, by industrial and local noise sorces. His unpleasant effects on humans, causing stressful time and affections of the human body, sometimes leads to fatal outcomes. The noise effects on humans increase as interact with other stressful environmental factors such as air pollution. This is especially for urban areas, where most of these stress factors exist. As a result, it is clear that the noise has a high social cost. 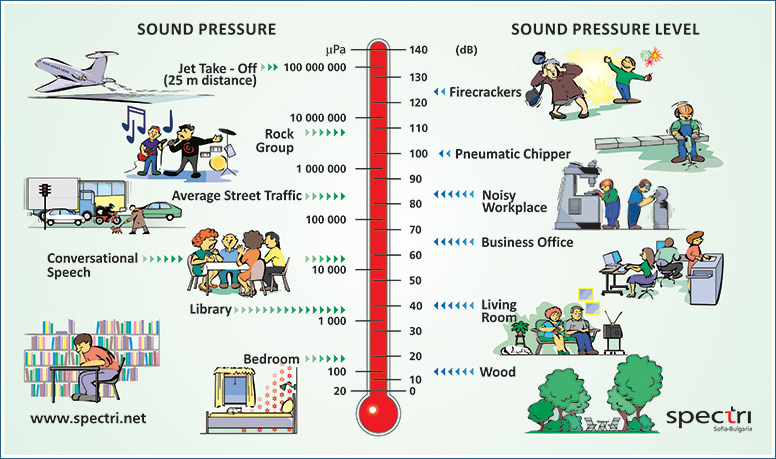 Noise has diverse effects on human health and is officially recognized by "The World Health Organization" (WHO) as a factor with a major impact on public health (figure below illustrates the levels of environmental noise and work environment). The most common effects are feelings of irritability, fatigue, concentration disturbance caused by noise. There is strong evidence that traffic noise leads to sleep disturbances, disruption of cognitive perception (especially among adolescents), as well as cardiovascular disease. WHO recorded more and more evidence of hypertensive conditions caused by noise. Increasing number of cases registered by the WHO for fatal outcomes (mainly heart attacks), and premature births - a result of exposure to excessive noise levels from road traffic. The WHO estimate, the social cost of noise from road traffic is not less than € 40 billion a year. The World Health Organization recently published guidelines for the night noise in Europe. The guidelines provide new evidence of harm to health from the noise exposure at night and recommended limits, which if breached, would endanger human health. WHO recommends the average noise exposure levels for night time may not exceed 40 dB (A) outdoors. People which are sleeping at night are noise exposed above 40 dB (A) average, which corresponds to the sound exposure on a quiet street, you may suffer from mild health effects, such as sleep disorders and insomnia. More than 55 dB (A) long-term average noise exposure, like the noise in a normal conversation, can lead to increased blood pressure and heart attacks. One in five Europeans is regularly exposed to noise above 55 dB (A) at night. The new conclusions of the WHO, based on concrete evidence, can be used by member states in the development of more effective noise protection measures. Environmental noise increases as well as the duration and as geographical coverage. Noise is related to many human activities, but the noise of the traffic, and to a lesser extent by rail and air traffic is the one that has the greatest impact. This is a real problem, especially for the urban environment: considering that the majority of the population, both in Europe and in Bulgaria live in cities or towns, through and along main road routes (such as streams traffic continues to increase). The illustration below shows the potential mechanisms for noise-induced effects on human health as well as their interrelationship. Noise acts as a stressor and attacking almost all organ systems of the human body. The high level of noise affects on hearing authority, central and autonomic nervous system. People become anxious, irritable, unable to work, often have headaches and dizziness, and suffering from insomnia. Abrupt unexpected noises increase the secretion of adrenaline from the adrenal glands, which leads to constriction of blood vessels, disruption of peripheral circulation and blood pressure. All this contributes to the development of hypertension and atherosclerosis and can lead to serious vascular events - strokes, heart attacks, blood clots, etc. As a powerful stressor noise does not exhaust its harmful effects on the body only with specific lesion of the auditory function. It affects the neuro-psychological sphere, cardiovascular, gastrointestinal, endocrine, metabolic, neuromuscular apparatus, etc. In a sense, can even be argued that non-specific effects of noise occupies an important place in pathology noise than the specific damage to the auditory function. Research has shown that there is no organ in the human body that is spared from the harmful effects of noise. The damage of unwanted noise is strongly expressed on children. The noise can affect their ability to concentrate, reading and writing. In classes where there is a loud noise, students showed significantly lower scores than those in the other classes in the same school where there is no noise pollution. According to the World Health Organization, at the community level, noise leads to a decrease in birth rates, disruption of learning ability, increases absenteeism and leads to increased drug abuse. It is proven that prolonged exposure to noise levels, higher than 70 dB (A) can lead to irreversible hearing loss. To protect the people from the harmful effects of noise have been adopted limits for individual noise indicators.To limit the noise i0os assumed that level for continuous operation noise does not cause changes in the entire range of physiological parameters reflecting the response of the most sensitive to the body's systems. Noise indicators and limits in Bulgaria are regulated by Regulation № 6 of 26 June 2006 on indicators for environmental noise, taking into account the degree of discomfort in different parts of the day, the limit values of indicators of environmental noise, methods for assessing the performance levels of noise and harmful effects of noise on health, (State Gazette. No. 58 July 18, 2006) issued by the Ministry of Health and Ministry of Environment and Water. Noise indicators are physical quantities that determine environmental noise, taking into account the range and degree of discomfort of people exposed to noise, depending on the nature of the noise, time of day, use of the rooms for occupancy, the nature of territories and areas inside and outside urban areas. Clock noise – L24, , which is a measure of noise annoyance throughout the day and is determined by calculation of the values of Lday, and Levg Lnight. The limit noise levels in different areas and development zones in urban areas and outside them are given in Table 2 of Application № 2 to art. 5 of Ordinance № 6/2006, which is given below.